It is perhaps not surprising that amongst the men and women who lived in the Egyptian desert, and who developed the monastic tradition one of the most inspiring is a man whose name means ‘Shepherd’ in Greek. His name is indicative of the way he is. His care and gentleness towards his brothers is an example of how to be a Christian: gentle, non-judgmental, forgiving, and loving. It shows us that to be Christian is to be Christ-like, gentle and loving. Living as we do here, out in the countryside, surrounded by fields, I suspect that the imagery in this morning’s readings is not completely lost on us. We are used to sheep and the shepherds who look after them. The care and devotion which a Shepherd should devote to his flock is a sign of God’s love and care for us, and to those of us who have been given any sort of pastoral responsibility in the church it serves as a reminder of who and what we are supposed to be: its cost, and the responsibility we share for the care of Christ’s flock, the burden and the joy. It is frightening to think how little our own strength and skill is compared to the task — we have to rely upon God, and his strength and not our own. In this morning’s first reading, we see what happens when it goes wrong (there’s advice for bishops here). The Kings of Israel are supposed to be shepherds, to care for and protect their flock. But they are not true shepherds as they exercise power selfishly, which destroys and drives away the sheep. The rulers seek power for its own sake, to make themselves feel grand and important, they become cruel and selfish. The rulers don’t care for the well-being of the people, who have scattered, gone wandering off, as the mood takes them. It’s all gone horribly wrong; and yet God, the true shepherd of our souls, does not leave his people comfortless. He promises to give them a good Shepherd, and points towards his son, the Good Shepherd, who will lay down his life for his sheep. The prophet Jeremiah looks forward to a future when there is a Messiah, a Good Shepherd, who is Christ, the Righteous Branch of David, who lays down his life for his sheep. This is care, this is self-giving love. This is how to rule, and care for the people of God, not in the exercising of arbitrary power. In St Paul’s letter to the Ephesians we see the work of the Good Shepherd and its fruits. He gives us life through his death. Through him the flock is united. Sin, that which divides, that which keeps us apart from God and each other, has been overcome by Jesus. He restores our relationship to one another and to God the Father, by laying down his life, by giving himself for us upon the cross and here in the Eucharist, where we the people of God are fed by God, are fed with God, to be built up into a holy nation, to become more like him, to have a hope of heaven, and of eternal peace and joy with him. In conquering the world and sin, Christ shows us that there is nothing God cannot do or indeed will not do for love of us. All divisions, all human sinfulness can be reconciled through Him who was sinless, who gave himself to be tortured and killed that we might be free and live forever. Paul sees the church in architectural terms: we have foundations in the teachings of the church, in the words of prophets which point to Jesus, and in teaching which comes from Jesus, through his apostles. We need to pay attention to this, as abandoning such things and preferring something modern and worldly causes this carefully constructed edifice to fall down. Buildings need foundations, and strong ones too. In this morning’s Gospel we see a picture of what good shepherds are like. Jesus and the apostles have been teaching the people, it’s a wonderful thing but it does take its toll. Jesus tells his disciples that it is time to have a rest, to spend some time alone, in prayer and refreshment. The people are so many; their needs are so great that the apostles have not had time to even eat. It is a recognisable picture, and it shows us how great was the people’s need for God, for God’s teaching, for his love and reconciliation. Jesus does not simply send the people away. Instead while the apostles are resting he takes pity on them because they are like sheep without a Shepherd. Jesus, who is the good Shepherd, will lay down his life for his sheep, to heal them and restore them. His people are hungry and in need of healing. So they will be healed by God, fed by God, and fed with God. God offers himself as food for his people and continues to do so. He will feed us here today, feed us with his body and blood, with his word, so that we may be healed and fed, so that we may be nourished, so that we may be strengthened to live our lives, that we may live lives which follow him, and that we may have the peace which passes all understanding. It’s a wonderful gift, which comes at a tremendous cost, which shows us how loving and generous God is towards us His people. Our response should be gratitude that we are fed in this way, that we have been reconciled to God through him. We should live lives fashioned after his example, lives which show his love and his truth to the world, lives which proclaim his victory, lives which will attract people to come inside the sheep-fold, to have new life in Jesus, to be with Jesus, to be fed by him, to be fed with him. It’s a difficult thing to do, to live this life, to follow His example But with God’s help, and by helping each other to do it together, we can, and thereby give glory to God the Father, God the Son, and God the Holy Spirit, to whom be ascribed as is most right and just, all might, majesty, glory dominion, and power, now and forever. It is far too easy nowadays to see the church in a negative way – it’s the fashionable thing to do – as the church we’re corrupt, we’re filling people’s heads with nonsense. We can be characterised as strange, quaint, and out of touch. It suits people to see us entirely in negative terms: as opposed to certain things. We are prescriptive: we limit people’s freedom, and in failing to practice what we preach, we can be written off as hypocrites, with no right to proclaim objective truth, to offer the world a moral framework, within which to live its life; to offer the world an alternative paradigm, a new way of living and of being through which to have life, and have life in all its fullness. It’s less a valid criticism and more of an excuse for people not to bother. It’s an easy way out, which saves people from the more difficult task of living Christ-like lives of love and self-sacrifice. The church does not claim to be perfect, but rather a collection of sinners justified by the grace of God, through faith in Christ. The simple truth is that people like to moan and grumble – we all do, and I’m as guilty of it as anyone, but there is a fundamental difference between being dissatisfied with the way things are and longing for change, and hopefully bringing about good change, change in a god-ward direction, and the corrosive moaning rooted in selfishness, which betrays a lack of trust in God. The Israelites in the desert represent this negative moaning, they are unable or unwilling to trust God to lead them on a journey towards the Promised Land, and while they realise their mistake their poisonous moaning has disastrous consequences for them. And yet even in this they are not abandoned by God, they gaze on the bronze serpent, they look to that which prefigures the Cross, through which God heals his people, taking their sins upon himself. That’s why it appears in stained-glass windows in churches, because it points to the Cross, it’s why when talking about the Cross Jesus mentions it, so that people might understand how and why God loves them and how it might affect their lives. This morning’s gospel reminds us of the fundamental truth that God loves us – it is the heart of the Good News – the Gospel, what we preach and what we live as Christians. There are few words as comforting as ‘For God so loved the world that he gave his only Son, so that everyone who believes in him may not perish but may have eternal life. ‘Indeed, God did not send the Son into the world to condemn the world, but in order that the world might be saved through him’ (Jn 3:16-17). They may be familiar to us, they certainly should be, but we must not let our familiarity with them cloud the significance of simply stating that God loves us, does not condemn us, but saves us, in and through Jesus Christ. That’s why we are Christians, it’s why we’re here, and recognising God’s love for us will have a transforming effect upon our lives. In the Incarnation Jesus comes among us as a poor helpless baby, laid to rest in the rough wood of an animals’ feeding trough. He is cared for through the love of his mother, the Blessed Virgin Mary, who in her love, her service, and obedience, stands as the model for all Christians to follow. She is the first Christian, the greatest, a pattern for us to imitate, of loving trust and obedience, of care and costly love, and a foreshadowing of our great mother the church, through which we are saved by grace through faith. Upon the rough wood of the cross, Jesus will suffer and die for us – such is the cost of human sin. His mother, Mary, stands by and watches and weeps. As the church we too should watch and weep for the wounds of human sin and division which still scar Christ’s body. We feel helpless. What can we do? We should do all that we can to live God’s life of sacrificial self giving love: living lives of light, which shine in the darkness. It isn’t easy, but if we try and do it together then all things are possible, through him who loves us. The salvation and eternal life which Christ offers freely to all, comes through the church, which we enter in baptism, where we are nourished in word and are sacrament, where we are nourished, given food for the journey, strengthened and taught, to live his risen life, to share in the joys of Easter. God cares so much about the world and its people that he takes flesh, and lives a life of love, amidst the messiness of humanity, to show us how to live lives filled with love, life in all its fullness. God in Christ comes among us not to condemn the world but to offer it a way of being, of being truly alive in Him. God has made us for himself, and our hearts are restless until they find their rest in him. The spiritual needs and searching which characterise people in the world around us can be satisfied in God and in God alone, through the church. We can rejoice, and relax our Lenten discipline for a little while to give thanks for the wonderful gift of God’s love in our lives, in the church, and for the world. But we also need to trust God, to listen to what he says through Scripture, to be fed by him, and to live lives in accordance with his will and purpose, together, as a family, as a community of love, cared for and supported by our mother, the church. And in so doing we look to Our Lady as Mother of Our Lord and Mother of the Church, as a pattern for love and obedience, as a model for all mothers: loving and tender, putting the needs of others before self, self-giving, sacrificial, and open to both joy and pain, trusting in God. This, as any mother can tell you, is not easy, it’s difficult, really hard, but its rewards are likewise great. 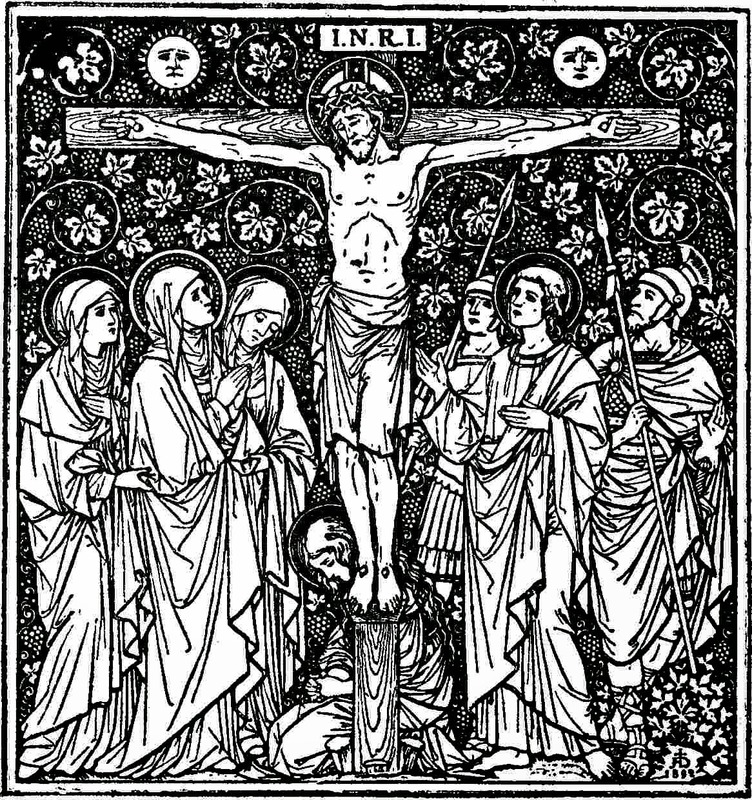 So let us, as we continue our Lenten journey towards the cross, where God shows his love for us most fully and completely, giving his body to be broken and his blood be shed for us, a sacrifice which will be made present here today under the outward forms of bread and wine, to strengthen us to live the risen life of Easter, to offer the world an alternative to selfishness, to self-centredness, to the sin which continues to separate us from God, an alternative shown to us in a self-giving love of mothers, and of our mother the church. So that we may join the Angels in our song of love and praise to the Trinity: Father, Son, and Holy Spirit, to whom..
‘There’s just no pleasing some people!’ If one wanted to sum up the opening of this morning’s Gospel then it would be hard to find better words. It is a truth as true now as it was two thousand years ago: it’s a facet of human nature, and something which God can redeem. The people of Israel have had the last of the prophets, John the Baptist, who came to them preaching repentance and the forgiveness of sins, living a simple life in the desert. His message is too hard for people, they think he’s mentally ill or possessed by an evil spirit. When Jesus comes, a friend of tax collectors and sinners, someone who clearly enjoys a party, as we see in the wedding at Cana in Galilee where he turns 180 gallons of water into the equivalent of 1100 bottles of wine, he’s a glutton and a drunkard. If you’re harsh and abstemious, it’s wrong, if you’re the life and soul of the party, that’s wrong too. The people of Israel are not searching for a golden mean, the midway between two extreme positions; they are simply unable or unwilling to accept either the difficult moral demands or the all-consuming joy of the Kingdom of God. ‘Yet wisdom is vindicated by her deeds’ Both John the Baptist and Our Lord bear witness to the truth of the Kingdom of God in their lives and in their deaths, and those who take no offense at Him will be blessed (Mt 11:6). The Kingdom of God preached by John and brought about by Jesus is not something for the wise and the intelligent – it does not require intellectual effort or knowledge. Instead it needs to be received like a child, simply, humbly and with trust. The key to it comes when we say ‘Yes’ to God, when we accept that we are loved and redeemed by Him, that His Love can save us from our sins, from pride, from intellectual arrogance, of thinking that weknow better, of being judgemental and unwilling to accept the harsh message of the prophet or the joyous celebration of the Messiah. At the heart of our faith is the mystery of the Incarnation, it’s why we celebrate Christmas, because the Word became flesh and dwelt among us, full of grace and truth. In Christ, God takes our humanity, so that He can redeem it. At the heart of this morning’s Gospel is the astounding statement “Come to me, all who labour and are heavy laden, and I will give you rest. Take my yoke upon you, and learn from me, for I am gentle and humble in heart, and you will find rest for your souls. For my yoke is easy, and my burden is light.” (Mt 11:28-30) Christ will bear the burden of our sins, the sins of the world, of the past, the present, and the future, upon Himself on the Cross. The message of the Gospel is to lay down your burden, to rest in the Lord, to bear Christ’s yoke and learn from Him. We do so with child-like trust in the God who loves us and saves us, we do so with humility, knowing our need of God, to cast ourselves upon his love and mercy. We cannot win our way to heaven, or gain salvation through our own efforts but rather in and through Christ, through our Baptism, nourished by His Word and His Body and Blood, so that we can have life in Him. There is something truly refreshing about the simplicity of the message – Christ says to each and every one of us, to the whole world, lay down your burdens and find life in all its fullness in Him. So let us come to Him, let us be fed by Him, fed with Him, to have life in Him. Let us take His burden and follow Him, learning from Him, freed from sin, freed from the ways of the world, from hardness of heart. Let us enter into the joy of the Lord, and encourage others to do so, so that they may believe and give glory to God the Father, God the son, and God the Holy Spirit, to who whom be ascribed as is most right and just, all might, majesty, glory, dominion and power, now and forever.